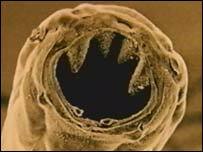 Home > Dogs & Cats > Organic Lawn & Garden > Are Hookworms in your soil? Hookworms (like roundworms and tapeworms) are intestinal parasites, but unlike roundworms and tapeworms they can persist and live in the soil and environment without an intermediate host. The hookworm enjoys warm, southern, tropical climates, but have even been found in more temperate areas such as North Carolina and Virginia. 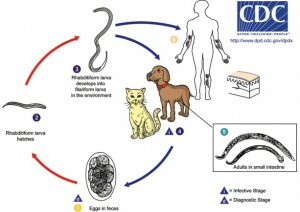 Most dogs (and cats) will acquire hookworm larvae by ingesting them during routine cleaning; however, hookworms are known to penetrate through the skin (paws, belly, etc.) into the digestive tract of the animal. There, they attach to the intestinal lining and deposit eggs, which are excreted into the feces of the dog or cat. The key step to controlling hookworms is to maintain a clean and sanitary environment. Picking up pet feces is an easy way to ensure you are doing your part to keeping your pet happy and healthy. For treating the environment, Wondercide recommends using EcoTreat Outdoor Pest Control organic lawn care in and around the yard to control the spread of hookworms and other parasites (fleas, ticks, mosquitoes). EcoTreat’s biggest attribute is its ability to dissolve insect egg and larvae, which is crucial in controlling hookworms. This will essentially break the egg layer cycle to create a barrier of re-entry, which will subsequently eliminate the next generation of insects. Voila, parasites no more! EcoTreat Outdoor Pest Control is a water soluble, natural lawn care concentrate that comes in pints, quarts, or gallon bottles. It is best applied with a hose-end sprayer outside and will provide multiple applications. To apply, just put 6-8 ounces of concentrate into the lawn sprayer. Either set the “concentrate” sprayer to 1tsp or fill the “pre-mix” sprayer to 26 ounces with water. Attach to the garden hose and start spraying. Spray dirt, grass, concrete, or any outdoor surface area because fleas, ticks, and hookworms can live anywhere! On first application, we recommend treating twice within 7-10 days. After that, treat routinely every 4-6 weeks. If you are controlling pests in a shelter or rescue setting where dogs come in and out all the time, you may safely treat more often as needed to maintain control of your environment. The same is true for areas with high pest pressure. Need to kill hookworms outside and most likely treat inside. I’m a rescue and the last dog that came brought them with him. Hi Melanie, Wondercide can help! Use EcoTreat in the lawn with a hose-end sprayer and BioDefense in the home. You will knock them out in no time! Thanks for all the hard work you do in rescue. We appreciate and support you. Where can you get the EcoTreat?? Thank you so much for your question! You can purchase EcoTreat Outdoor Pest Control online at wondercide.com, at independent stores across the US, or on Amazon. We hope that helps, but let us know if we can assist with anything else. Cheers! Thank you for your message, Michael. Wondercide can definitely help you take care of hookworms in a safe, natural way. Our Outdoor Pest Control works to erode away at the entire life-cycle of the worms, and will rid you of these nasty pests. For the initial treatment, we recommend completely spraying the yard down twice- doing the first treatment, and then 7-10 days doing another, with both treatments being at the stronger 8oz dilution of the product for maximum results. This should break the current life-cycle of hookworms that are in your yard. To prevent them from reestablishing, you can reapply every 30-45 days. If you’d like more treatment details, or if there is anything further we can help you with, please don’t hesitate to reach out. We’re here for you! Hi, what is the Biodefense? Thanks for your question, Gerwayne. Biodefense was an older name for our Indoor Pest Control product. We’ve updated the label and the formula for this spray, but it is still effective at killing hookworms (and other pests) in your indoor environment. Let us know if there is anything further we can help with! I would like to use this product to control hookworms and fleas at a local shelter that I volunteer at. Because new dogs come in all of the time, I was wondering how often I would need to apply this product to keep the hookworms and fleas at bay? Thank you. Hi Jenny, on first application, we recommend treating twice within 7-10 days. After that, treat routinely every 4-6 weeks. If you are controlling pests in a shelter or rescue setting where dogs come in and out all the time, you may safely treat more often as needed to maintain control of your environment. What is the product that I can purchase to spray my yard to control hookworms in the sandy soil that won’t harm my 7 dogs? I pick up the yard every day, but we still get ’em at least once a year. I keep reading about spraying the yard, but I don’t know what to buy. Thanks for your question! We recommend using EcoTreat to control all stages of the hookworm life cycle in your yard. It’s completely safe for your pets and made from food grade ingredients. So animals can go on the lawn immediately after you treat it? Thanks so much for your question! The great news is because our Flea and Tick for Yard + Garden and our Outdoor Pest Control concentrates are both made from safe, non-toxic ingredients, it is indeed safe for your pets to go back into your yard or lawn area immediately after treatment! Let us know if there is anything else we can help you with! I found out my puppy has hookworms, we’ve been potty training her but lately the weather has turned very wet. I’m afraid that the surviving eggs will hatch. Will your product harm my lawn? I also take it that it won’t harm my cat when he walks on the grass. Hi Jessica! Thanks for your question. Our outdoor lawn product will NOT harm your lawn. Be sure not to use the indoor product on your yard, as our indoor spray is not made for plants. Will this product harm beneficial nematodes? We put them out for flea control yearly and it says not to use other products on the lawn. Nematodes live in soil and thrive in moist areas. Drenching the soil would possibly affect the nematodes if you were using straight cedar oil, but only because they need a moist environment and the oil would obviously inhibit that. If using EcoTreat or Flea & Tick Control for Yard + Garden, it’s possible that the first layer of nematodes would be affected, but waiting a week after laying the nematodes to apply EcoTreat or Flea & Tick Control for Yard + Garden will solve this! I believe we have a hookworm infestation in an ivy patch on our lawn. Will the product work on/around ivy? Sorry to hear about your hookworm infestation! Our natural outdoor pest control products are safe for plants, so you can use them on and around ivy. Be as thorough as possible to ensure the solution makes it to the soil. To treat for an infestation, apply Wondercide to your yard twice within the first 7 days, and then you can switch to treating every 30-45 days to keep the pests away. You can also check out our how-to video to see how it’s done! Hope this helps. We keep getting hookworms in our dogs. Treated with panacure but keep getting them. Neighbors dogs or from squirrels. I always clean up after dogs. We have no grass just dirt. Will this help me get rid of them? Where do I get it? Hi, William. Sorry to hear that you are having an issue with hookworms! While hookworm medications will treat the parasites already in your dog, unfortunately if your yard also has hookworms, your pets will continue to pick them up from outside. Wondercide’s Flea & Tick Control for Yard + Garden will kill the hookworms that live in your yard, so your pups won’t keep getting them. You can purchase the product online or in retail stores around the country. Just be sure to follow the instructions for treatment to completely eliminate the hookworm lifecycle! A dog we rescued had hookworm and whipworm. His poop was diarrhea for the first week here, so it was impossible to pick up. Will Wondercide kill whipworm and their eggs too? Sorry to hear about your rescue’s parasite problem! Wondercide Flea & Tick Control for Yard + Garden (or Ecotreat) will kill whipworms in all life cycle stages in your yard. If your pup is still suffering from whipworm, you may also want to try Neem Bark Powder, a natural dewormer, so your dog doesn’t spread worms back into the yard. Hope that helps! Feel free to email service@wondercide.com with any other questions! I RESCUED A DOG FOR MY SON. The dog was covered with fleas and had ticks really bad. I took him to the vet to see if had tapeworms and heartworm, and I found out he got hookworms. Googled for something that would kill this in our wet, swampy backyard. It gets like this when it rains a lot here in FL. I would like to know 2 things: where I can buy it and if I could get a coupon. I will need to buy like 2 to 3 gal for what I read on here for my size yard. Thanks for your question! You can order Wondercide online at http://www.wondercide.com, via phone at 877-896-7426, or on Amazon Prime. My dogs have recently gotten hookworms twice in a 3 month period. So I’m pretty sure we have an infestation in my yard. In reading these comments I see you recommend Ecotreat to some and the Flea & Tick control to others. Just wondering which one would work best and is safest since my 3 year old is kinda obsessed with playing in the dirt. Thanks for the question! Ecotreat and Flea & Tick Control for Yard + Garden actually have the same formulation: cedar oil & ethyl lactate are the ingredients. They are labeled differently for end use and compliance reasons only. Since you have dogs, we’d suggest you go with Fla & Tick Control for Yard + Garden for ease of use. Please let us know if we can help with anything else! Will this product kill round worm eggs in a yard? Yes! Use the 8 oz concentration and really make sure you saturate the soil, as that’s where they lay their eggs. Thanks for your question, Erin! Both rain and people or pets walking in the grass can push the hookworm and eggs into the soil. Whether the hookworms are in the soil or in animal excrement on top of the soil, Wondercide outdoor pest control products just needs to make contact with the worm eggs, larvae, or pupae in order to wipe them out. With 2 treatments spaced out 7-10 days apart, the natural product will kill all stages of the hookworm life cycle. You can read more about how cedar kills pests HERE. Hope that helps! Have a great day! Thanks for your question, Stasia! Our outdoor products do kill roundworm and whipworms in all life cycle stages. Hope that helps! Thank you again for reaching out! What product will kill round worm and whipworm eggs larvae and all? And where can I get it? Hey, Stasia! Thanks for reaching out again! You can use Flea & Tick Yard + Garden to kill roundworm and whipworm life cycle stages outdoors: http://www.wondercide.com/natural-outdoor-flea-tick-control/ You can see our store locator HERE or order online at wondercide.com – Have a great day! Hi! We got a puppy in December. It was a warmer December, rainy when we got her. She used the backyard and had very bad diarrhea, and we couldn’t clean anything up. Took her to the vet and found out she had hookworms, coccidia and tape worms. Once we found out about hookworms we treated her immediately and kept her out of the back yard. Until a couple months ago we were picking up her feces in the front yard immediately and even pouring bleach on the spots where she pooped when she had such bad diarrhea. Now.. The back yard obviously was infested with hookworms. We just now finally started letting her back there because she is on Heartgaurd plus to protect her. I’m very concerned though because we have a 6-year-old daughter who likes to play in the yard (sprinklers etc. during the summer) and I don’t want her to get hookworms. We have VERY long thick Kentucky grass. Will this actually kill ALL hookworms in the soil and make it safe for us to be barefoot?? Thanks so much for reaching out. We’re sorry to hear you’ve gone through so much with your pup! The great news is we can definitely help. For treating the environment, Wondercide recommends using EcoTreat Outdoor Pest Control in and around the yard to control the spread of hookworms and other parasites (fleas, ticks, mosquitoes). EcoTreat’s biggest attribute is its ability to dissolve insect egg and larvae, which is crucial in controlling hookworms. This will essentially break the egg layer cycle to create a barrier of re-entry, which will subsequently eliminate the next generation of insects. Voila, parasites no more! EcoTreat is best applied with a hose-end sprayer outside and will provide multiple applications. To apply, just put 6-8 ounces of concentrate into a hose-end sprayer. Either set the “concentrate” sprayer to 1tsp or fill the “pre-mix” sprayer with water. Attach to the garden hose and start spraying. Spray dirt, grass, concrete, or any outdoor surface area because hookworms can live anywhere! We recommend a repeat application 7-10 days after the initial application. Because EcoTreat is made with natural ingredients, it’s safe to walk on barefoot. We adopted a dog 3 weeks ago, and took it in for its first checkup. It has hookworm. We are treating it per vet’s instructions. Now, we want to treat our lawn with a homemade mixture. We heard that if you mix bleach and water, you can safely spray it on the lawn. What is the water to bleach ratio in ounces? Thanks for your question! I’m so happy to hear you decided to adopt your sweet pup, but hate that they came home with hookworms! While there are many home remedies that people have used over the years to treat these bothersome pests, we cannot speak to the efficacy or safety of using bleach in the yard to kill hookworms. In some instances, even diluted bleach will kill grass and plant life, so we would certainly advise using caution if you are going to pour anything like this on your grass or lawn. If you are interested in products that can help kill these worms in a safe, natural, and effective way, our Flea and Tick for Yard + Garden can be applied to your outdoor environments, is plant and pet safe, and will kill hookworms and their eggs and larvae in the soil! I hope this helps! Please feel free to reach out with any further questions, and have a great day! Congrats on your new puppy; that’s so exciting! Wondercide can definitely help you take care of hookworms in a safe, natural way. Our EcoTreat Outdoor Pest Control works to erode away at the entire life-cycle of the worms, and will help rid you of these nasty pests. We even have a handy blog post specifically about hookworms and using the EcoTreat HERE. All of our products are made from human food-grade ingredients, are completely non-toxic, and safe enough that you and your pups can start enjoying the yard again immediately after applying! For the initial treatment, we recommend completely spraying the yard down twice- doing the first treatment, and then 7-10 days doing another, with both being at the stronger 8oz dilution of the product for maximum results. We’d recommend applying it with a hose end sprayer and a garden hose, at 8oz dilution. This should break the current life-cycle of hookworms that are in your yard, and then to prevent them from reestablishing reapply every 30-45 days. I hope this helps, but if you have any further questions please feel free to reach out! In order to treat 1/2 acre, I’m trying to figure how much I’ll need. It’ seems that I need 32 oz to cover that ground, and need to repeat after 10 days again with 32 oz. size. What about maintainence, do I understand correctly that I need to cover the 1/2 acre every 30 days or so? Please help me figure this out, seems like it’s beyond my budget? So I should order two 32 oz size now and more every 30 days? For how long? That could definitely go beyond my means. If you’ll be treating 1/2 of an acre, your original calculations are correct- one 32oz bottle of outdoor concentrate will treat up to a total of 21,000 square feet (or 1/2 an acre) one time when applied at the 6oz dilution ratio. So for the two initial treatments, if you were treating at the 6oz dilution, you would need a total of 64oz of concentrate. Maintenance treatments would be every 30-45 days if desired. For a piece of property as large as yours, we would certainly recommend considering the 1-gallon sized bottle. This is 128oz, and should cover 4 full treatments at the 6oz ratio, and is a more economical solution than buying x4 32oz bottles separately. Or, if you feel like this might be too much for you, we do have customers who report back good results with just treating the areas they actively use in their yards. We of course always say for best results to treat as much as you are able, however this is certainly an option you could pursue if treating the full 1/2 acre is a bit too much! Thanks so much for your interest in Wondercide, and please feel free to reach out to us if you have any further questions! I am looking for advise on treating my backyard for hook worms. I have used your product “Ecotreat” for several months now, as directed. Unfortunately, my other dog has now gotten them. I’m a little hesitant to use the same product since it obviously didn’t work. What’s the difference between the Ecotreat and the Flea and Tick? I have grass, dirt, and rocks and live in the hot AZ sun. Thanks. Sorry to hear that you have not been able to get rid of hookworms with Ecotreat. Ecotreat and Flea & Tick Yard + Garden actually have the same formulation, just with different label instructions for end-use. One thing you may want to check is that you are using the “treatment” dilution in instructions rather than the “prevention” dilution and that you have used enough product for the square footage of the outdoor space. You can even use a slightly stronger dilution (more Ecotreat) for the hookworm issue if they’re especially stubborn. Also, since hookworms are shed in the feces of pets, it is important to treat your dog for them and pick up after them immediately to ensure that they don’t reinfect the yard. You can consult a holistic veterinarian on the best ways to expel hookworms from your dog’s system, and you can also boost their immune system and help deter parasites with Neem Bark Powder. If you’ve already tried these things and would prefer a refund on the Ecotreat, we do have a 30-day return policy at wondercide.com on orders under $225. I hope this information is helpful, but please let us know if we can assist with anything further! What kind of research as been done on the efficacy of getting rid of all life cycle stages of hookworms in yards and grass? I live in Florida where the soil is sandy and the temperature and humidity is favorable to the hookworm. I have 2 foster puppies that have been diagnosed with hookworms. What product should I purchase? I would like to continue using this product if it’s good. I want to make sure that this product will work before I spend this much money and time treating with it. Also, is there a coupon code that I can use? Thank you. Wondercide can definitely help you take care of hookworms in a safe, natural way. Our EcoTreat Outdoor Pest Control works to erode away at the entire life-cycle of the worms and will help rid you of these nasty pests. All of our products are made from human grade ingredients and are safe enough that you and your pups can start enjoying the yard again immediately after applying. For the initial treatment, we recommend completely spraying the yard down twice- doing the first treatment, and then 7-10 days doing another, with both being at the stronger 8oz dilution of the product for maximum results. This should break the current life-cycle of hookworms that are in your yard, and then, to prevent them from reestablishing, reapply every 30-45 days. We don’t have any current discount codes floating around at the moment, unfortunately. We do offer free shipping on orders over $49! Feel free to sign up for our newsletter on our website so we can notify you when new offers are available. I hope this helps, but if you have any further questions please feel free to reach out. Have a PAWsome day! These worms are white, flat in shape, and have ¼-inch segments connected with each other. They easily reach the gut when a dog swallows fleas. Once inside, these worms attach themselves to the intestinal walls and can grow about 4 to 28 inches in length. How much of a yard would that cover? We have a 2 acre backyard, so am wondering how much I would need to purchase for 2 treatments 7-10 days apart. Thank you for your comment. You’re doing great things by choosing natural products for your yard. For the 2 initial treatments, we recommend purchasing 3 gallons of our Flea & Tick for Yard + Garden. Each gallon diluted at 8 oz will cover 1.5 acres. That is enough for the two initial treatments, and one light treatment if needed for maintenance. We hope this helps, but please feel free to reach out with any further questions. We’re here for you. Cheers! Yes, our Outdoor Natural Pest Control concentrates also work to kill roundworms and tapeworms, as well as a variety of other “bad bugs” and parasites. Please let us know if you have any questions, or we can offer any additional information to rid you of these pests. We’re here for you! We have hookworm infestation affecting our goat herd. Is it safe to use around livestock who graze and eat from the grass and tree brush?? We are in DESPERATE NEED of a solution to our HUGE problem. We treat with wormer as per our Vet orders But continue to have problems. Leading to deaths!!! Please help. We understand how difficult hookworms can be, which is why we’re happy to recommend our Outdoor Pest Control concentrate for treating your land. The product will kill hookworms and their life cycle in your soil. Because we only use natural, human-grade ingredients, is safe enough for your goats to graze on the grass after treatment. We welcome you to reach out to us directly at hello@wondercide.com/877-896-7426 to further discussant your needs. We’re here for you! I’m buying a house on a third of an acre. The renter had 3 dogs and never picked up after them. I want to sterilize the soil and make sure I kill off all parasites and anything else that could be unsafe for root crops. I’m going to have to scoop a lot of pooo first but then what? Wondercide can definitely help you take care of pests and parasites in a safe, natural way. Our EcoTreat Outdoor Pest Control works to erode away at the entire life-cycle of the worms, and will help rid you of these nasty pests. For the initial treatment, we recommend completely spraying the yard down twice- doing the first treatment, and then 7-10 days doing another, with both treatments being at the stronger 8oz dilution of the product for maximum results. This break the current life-cycle of pests that are in your yard. To prevent them from reestablishing, you can reapply every 30-45 days. If you have any further questions please feel free to reach out. We’re here to help! Does the Wondercide BioDefense used indoors take care of all worms including tapeworm, round worm & hookworms? i have neighborhood cats that i had taken to the S/N program and some have come indoors. i plan to keep one of them indoors. the others are eventually going outside. The Indoor Pest Control spray (formerly called BioDefense) is effective at eliminating hooks, rounds, and tape worms in your indoor environment. Be sure to spray thoroughly throughout the home, as hook and round worms especially are very easily spread. If the cats have had any contact with your outdoor areas, we would also recommend spraying your yard with our Outdoor Pest Control to ensure complete control against these pests. We’re here for you if you have any further questions, and welcome you to reach back out. Hi, I just found out my dog we adopted has worms. I bought the Ecotreat so I could treat my lawn but I was wondering how safe is it if my dog likes to eat the grass? Great move getting the EcoTreat Outdoor Pest Control to treat your yard! This spray is made with human food-grade and non-toxic ingredients so it’s safe for your dog to be in the yard immediately after you spray. However, it is not intended for consumption. Nibbling on some grass that has been treated is ok, but we’d recommend discouraging over-consumption, as it may lead to stomach upset. My name is Jackie. I have two small children 3 years old and 18 months. They love to play in the yard and the grass and roll around in the grass and the dirt. We recently discovered we have a hookworm infestation. If I apply your product to my yard is it safe for my children? I know you say the ingredients are natural, however there are plenty of natural ingredients that are harmful to humans. After application do I have to wait a certain time period before my children can play in the yard? Our EcoTreat Outdoor Pest Control kills the entire hookworm life-cycle, and is safe for both animals and people (even when wet). Because this spray is made from safe, human food-grade ingredients, there’s no wait time and you and your children can enjoying being outside against immediately after application. If you’d like more tips on how to treat for hookworms, or if you have any further questions, please don’t hesitate to reach back out! We’re here for you! I am currently on my third round of treatment for hookworms for my 2 greyhounds. I have over an acre, so spraying the yard is not practical and I don’t have a hose that can reach the back of the property anyway. I do clean up after them right away. Would spraying their “favorite areas” as well as the ground after I pick up after them still help with my battle against these little devils? ​Even casual contact with infected ground can spread the hookworms and their eggs around your yard, as can rain and watering. Because of this, we do strongly recommend a full environmental treatment to ensure these pests are completely eliminated. Saying that, spraying areas where your dogs frequent as well as thoroughly spraying the ground after infected feces are picked up can help you control the worms in those areas. ​We’re here for you if you’d like additional info on how to treat for hookworms, and welcome you to reach back out if we can help. I just got a new puppy and she came with intestinal roundworms. We did not know it at first but now they seem to be living in the grass because I keep finding them crawling onto our driveway. I was under the impression that they couldn’t live outside the body, but that must not be the case. Does your product kill these? Yes, Wondercide can definitely eliminate roundworms in a safe, natural way. Our EcoTreat Outdoor Pest Control works to erode away at the entire life-cycle of the worms, and will help rid you of these nasty pests. All of our products are made from human food-grade ingredients, are completely non-toxic, and safe enough that you and your pups can start enjoying the yard again immediately after applying! I just found out my Maxie, a rescue dog has Hook Worms again, or still. We adopted her over a year ago and she has them when we first got her. My question is will Wondercide hurt any of the plants in my garden if i spray the entire yard? I have a Monach Butterfly garden, will it hurt the eggs, caterpillars, chrysalis, and butterflies. I read only salt or borax will kill these things. ​Yes, our Outdoor Pest Control is safe for plants, and can be sprayed directly on grass, trees, flower beds, etc. Its important to be thorough when treating for hookworms, so making sure all of these things are sprayed is important. Its also safe for beneficial insects, like bees and butterflies. Our products work because of the cedar oil we use, which affects pheromone-driven pests (like fleas and ticks). Cedar oil blocks these pests’ ability to produce octopamine (which they need for breathing, movement, etc), and causes them to be repelled from the area. When contacted, pests suffocate and die. Mammals, birds, fish, amphibians and beneficial insects are not affected by cedar oil in this way, because they do not have octopamine neurotransmitters! My Chihuahua has hookworms now for the second time. Can hookworms get into the carpet where my Chi has had diarrhea? Hookworms typically spread outdoors through soil, but can be deposited indoors if an affected pet defecates indoors. The good news is, Wondercide can help you treat these pests both indoors and out. For inside the home, our Flea & Tick for Pets + Home spray will actually kill the worms and their eggs/larvae by-contact, and can be sprayed on carpeted areas, pet bedding, etc. For outdoors, our Flea & Tick for Yard + Garden will eliminate these pests from your soil and provide last control and protection. We do ship to Australia, and you can order all of our products at Wondercide.com. To get a shipping estimate, just view your cart before checkout (https://www.wondercide.com/checkout/cart/). We don’t currently have any retail stores outside of the US, but hope to in the future! Hi! I am a rescue volunteer. I just had an adopter inform me that my last foster dog has been diagnosed with hookworm. I was not always good about picking up the stool, thought the dog was already dewormed. I also have deer & rodents that defecate in my fenced in backyard. I’m worried about my dogs getting parasites/worms. My dogs also like to eat grass. I am going to have their stool tested but I feel that treating the lawn would be smart. How can your product kill these parasites/worms but not harm my dogs? Wondercide can definitely help you take care of hookworms in a safe, natural way. Our EcoTreat Outdoor Pest Control works to erode away at the entire life-cycle of the worms, and will help rid you of these nasty pests. All of our products are made from human food-grade ingredients, are completely non-toxic, and safe enough that you and your pups can start enjoying the yard again immediately after applying (its even fine if your dog nibbles some grass after treatment). The active ingredient in all of our pest control products is cedar oil— cedar oil affects octopamine, which is essential to life for pheromone-driven pests/parasites (like hookworms). Its responsible for regulating heart rate, movement and behavior in these pests, and when contacted directly causes them to suffocate and die. Cedar oil is safe for mammals, birds, fish, amphibians and beneficial insects, because they do not utilize octopamine neurotransmitters in the same way that the pheromone-driven pests do. If you have any further questions please feel free to reach out at hello@wondercide.com or by phone at 877-896-7426. We’re here to help! Does this work for round worms? And can I use this to kill them in the yard effectively? Our pups have been going through a continuous cycle with them and I’m at a point I would like to do what I can, including treating the yard to kill them. Through my research, the only thing I have found to work in killing them in the yard was sodium borate (Borax), but with the warnings of it potentially killing our yard, I have been trying to find an alternative. Will this harm my pups, and will it kill our yard? Yes! Our EcoTreat Outdoor Pest Control works to erode away at the entire life-cycle of roundworms (adults, eggs, and larvae) and will help rid you of these nasty pests. For the initial treatment, we recommend completely spraying the yard down twice- doing the first treatment, and then 7-10 days doing another, with both treatments being at the stronger 8oz dilution of the product for maximum results. This should break the current life-cycle of worms that are in your yard. To prevent them from re-establishing, you can reapply every 30-45 days. All of our products are made from human food-grade ingredients, are completely non-toxic, and safe enough that you and your pups can start enjoying the yard again immediately after applying! They are also plant-safe, and will not harm the plants in your yard. What do hookworm lervae look like? Use the link below to see information on the lifecycle of hookworms. Hookworm larvae look like smaller versions of adults. Please let us know if you have any other questions. We’re here to help! Do you have anything to treat my dogs and cats for hookworms? We can offer products that can kill hookworms in your environment but don’t have any treatment that can be taken by pets if they already have hookworms internally. We recommend Flea & Tick for Pets + Home and Flea & Tick for Yard + Garden. Our sprays will repel and kill hookworms, so they can be an effective part of your hookworm prevention program. For maximum results, do two thorough treatments, 7-10 days apart of each other, at the stronger 8oz dilution ratio. This should break the current life-cycle of hookworms that are in your yard. To prevent them from re-establishing, reapply every 30-45 days. Will the hookworm treatment cause any damage to the grass or plants in the yard? Our outdoor concentrate is safe to apply in your yard on grass and plants but to avoid browning of leaves or phytotoxic burn apply in mild temperatures under 90 degrees F.
Can these products be applied in colder temperatures? And can they be applied to very wet soil? Yes, you can apply Wondercide’s outdoor sprays in cold temperatures so long as they are above freezing. Damp soil is fine, but waiting for excessive wet soil (like areas with standing water) to dry is best to ensure the product is able to properly saturate into the earth (where the hookworms and their eggs/larvae will be). If you’ll be expecting heavy rain, remember to hold off applying for a few days until clearer weather. My dog has hookworms for the second time in 1 year. He may be getting them from squirrel droppings in our yard. What is the difference between Eco Treat Outdoor and Flea and Tick for Pets Home Spray? You said in one blog that you can use either one for outdoor radicalization of hookworms. Which one is best for hookworms? The Flea & Tick for Yard+Garden and the Outdoor Pest Control concentrates are the exact same formulation, just labeled a bit differently to help customers find the best product to suit their needs. Both concentrates work to kill and control all of the same pests including hookworms and can be used interchangeably. 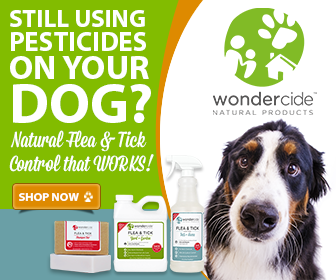 Does Wondercide work as a treatment for hookworms, whipworms AND fleas? Looking for an all encompassing product before I buy to make sure I’m getting the right product. Yes, out outdoor concentrate is effective against a wide variety of pests including fleas and parasitic worms like hookworms and whipworms. Our Outdoor Pest Control or Flea and Tick Control for Yard + Garden work to erode away at the entire life-cycle of the worms and will help rid you of these nasty pests. For maximum results, do two initial treatments. Do you first full application and then a second full application 7-10 days later. Both should be at the stronger 8oz dilution ratio. This will break the current life-cycle of hookworms that are in your yard. To prevent them from re-establishing, reapply every 30-45 days. We recommend a hose-end sprayer like our Ready-To-Use sprayer. It comes pre-mixed at the 8oz dilution ratio and can treat around 4,000-5,000 sq feet on average. Once you’ve used it up the first time you can buy the concentrate and refill it.